Last weekend, there were some serious monster-animals gone wild movies on the Syfy channel. I, of course, didn’t watch any of them…(well, maybe just a wee bit of Piranha, (the remake where Jerry O’connell gets a seriously over the top pedicure and leg wax), but I digress. I did manage to work on a project that just might qualify a Mega Syfy movie weekend as a research driven tax right off! Let me just say right up front, if anyone yells out, CrocNado!!! !, I will not be amused. 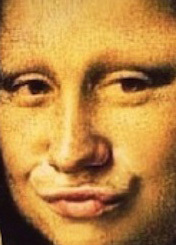 I may chuckle quietly, and show my best Mona Lisa smile, but there will be no amusement! Garden Art is serious business, and I aim to remain focused. My purpose here is to show a piece of sculpture that is in progress. 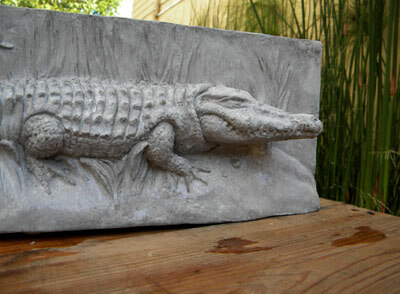 This Croc(k) sculpture is a fresh concrete casting of my original sculpture. It is meant to sit upright, and will be perfect as an indoor object d’art, (yes, sometimes I describe my artwork using the beautiful French language), or as a lovely garden accent (American / English). I do realize Crocodile art won’t be everybody’s cup of tea, but I happen to think the beasts are très beau! My next step is to apply layers of acid stains to the surface, which will react chemically with the minerals in the concrete to produce a one-of-a-kind color finish. Acid staining is an art in itself. The results become more predictable with experience. Once you apply the stain, it does not come off! As I always say…or at least once in while I say it, or whenever I say it ~ a card laid is a card played! (I’ll say it from now on). 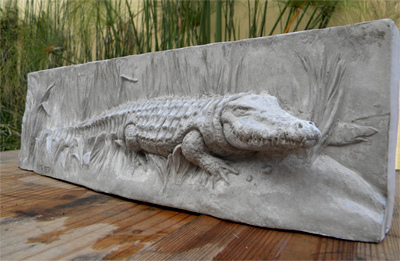 I have lost more than one piece due to bad staining results, and this is a perfect casting that I don’t want to lose.